The term ‘open dining’ conjures up images of group therapy sessions – a kind of Foodies Anonymous, where earnest ingredient hunters fess up to the fact it’s been three days since they last tasted baobab or freekeh. In fact, it’s the term coined for the trend for kitchens to be in the main body of a restaurant, rather than discreetly tucked away behind closed doors. 64 Degrees is one of a handful of open diners in Brighton. 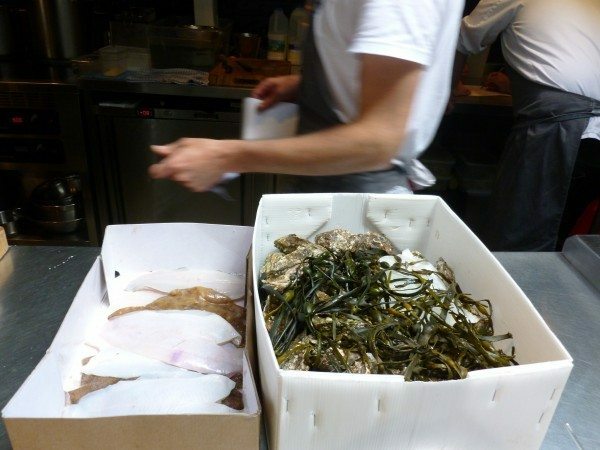 Others include The Set, Isaac At and Market, which will open in Hove soon. The kitchen takes up a sizeable chunk of the venue and the 24 covers are fitted around a bar, which runs alongside, and at a handful of tables out front. It’s busy but not full to bursting when we dine at lunchtime on a Tuesday. At weekends it’s more of a squash but the restaurant does three separate evening sittings, squeezing in in over sixty diners each night. Depending on your personal levels of openness, this either makes for a highly interactive eating experience – we get to the observe the chef as he marinates mackerel in an elderflower vinegar ceviche, he gets to hear all about my dining companion’s 50th birthday celebrations – or one that’s a bit too, well, open. The thing is, there’s nowhere to hide. If you’re planning to propose, expect the other diners to congratulate you, if you’ve got any secrets, best to eat them before you sit down. The same goes for the chefs – no Gordon Ramsay style swearing at staff or messing about with the food. In the past, open kitchen design arose out of lack of space but celebrity chefs and a fascination with watching how our food is prepared have boosted its popularity. It’s a bit like site-specific theatre, you can’t simply sink into your seat in the stalls and watch the action unfold – you’re a part of it. 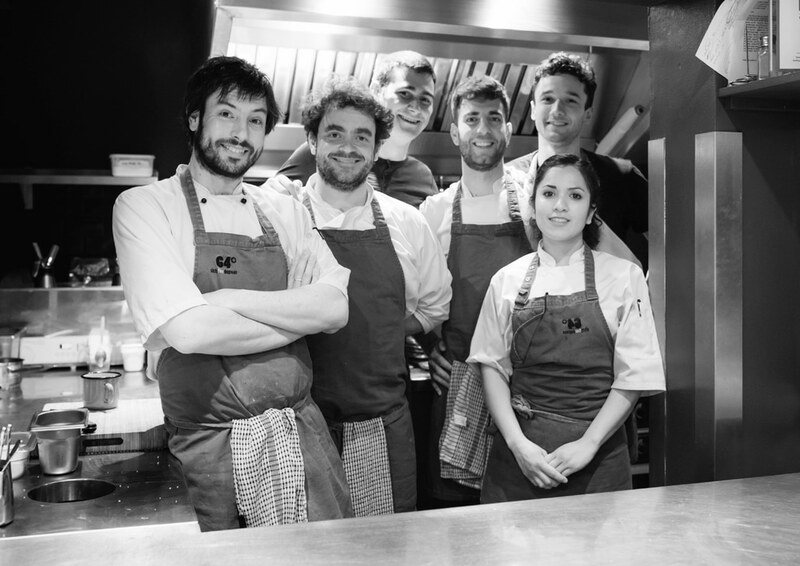 And from the moment we arrive and our shown to our ringside seats, perched on bar stools right on the edge of the kitchen, we are involved in the preparation of our meal. “Is it caught locally?” my 50-year-old friend asks, as mackerel is cut into wafer thin slice. “What’s the sauce?” I wonder out loud, as a chef smoothes a reddish orange paste around a plate. Like I said. It’s all very open. But before my companion has remaked on the brilliance of this, the menu arrives and requires my attention. It’s brilliant in its simplicity – a four-meat, four-fish, four-veg affair and we’re encouraged to choose several and plate share. We choose five mains and save one for pudding. 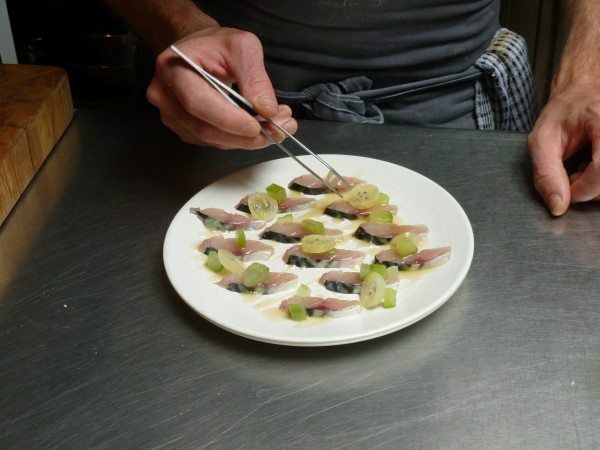 First up is the mackerel that, moments earlier, was being marinated in a ceviche of elderflower vinegar and is now being garnished with gooseberries. It’s not really necessary for the waitress to bring the plate round to us – we could just reach over and help ourselves, but this is not Yo Sushi, even if the fish is raw and fresh and tastes of the sea and summer, with its elderflower and gooseberry companions on the plate. The restaurant’s name comes from the precision cooked “house egg”, bathed at 64 degrees in a water bath. The open kitchen here isn’t all about entertainment but also demonstrating skills and attention to detail, which have earned 64 its formidable reputation. It’s not just the chef’s who are on view but the gadgets too – this is vorsprung durch technik cuisine with equipment to dazzle. 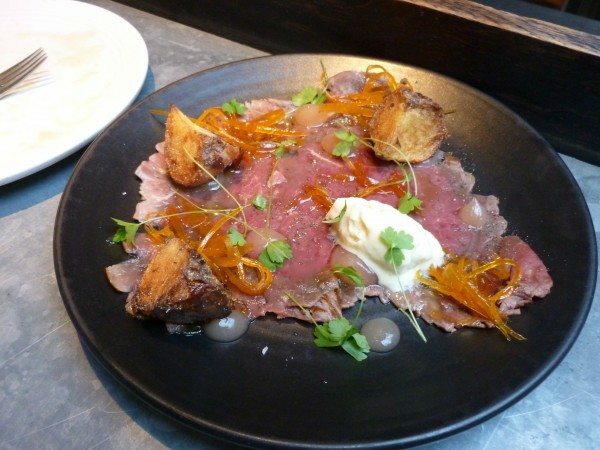 I’m telling my dining companion (and by default the chefs) about a forthcoming trip to Venice, when a dish of beef Carpaccio replaces our empty mackerel one. My companion is a font of all knowledge: “Did you know this was named after the Venetian painter Vittore Carpaccio?” he asks. I didn’t. I look to the chef but he’s busy with another order so we tuck into slivers of raw beef with a dollop of turnip ice cream and caramelised grapefruit. I can’t help thinking of Baldrick as I try the ice cream. It’s a first, but the earthy crème fraiche works surprisingly well with the meat and citrus tang of the grapefruit. 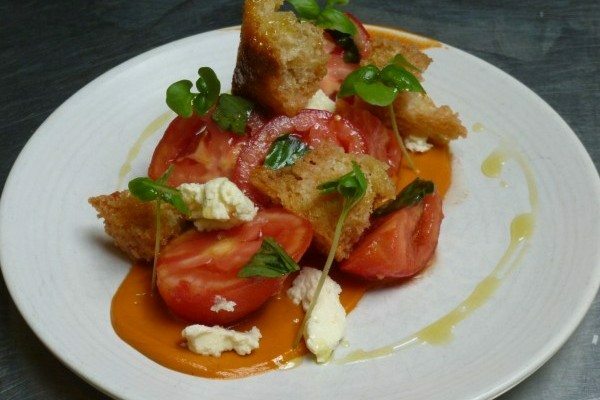 Next up is an elegant ensemble of tomatoes and ricotta with romesco sauce, like the one we saw being prepared in a Blue Peter time slip, followed by a piece de vegetable resistance, hispi cabbage with broad bean puree. That’s what it says on the menu but don’t be fooled by the simplicity of the wording. 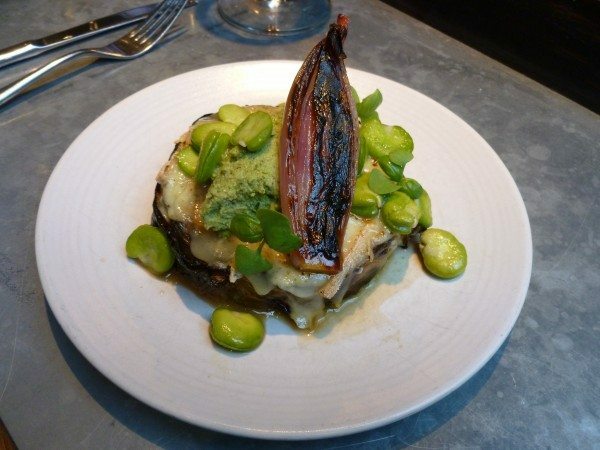 What we are served is a thick slice of a whole slow roasted cabbage (nearly two hours at just the right temperature), topped with blow torched raclette and served with broad bean purée, caramelised onions and chardonnay vinegar. 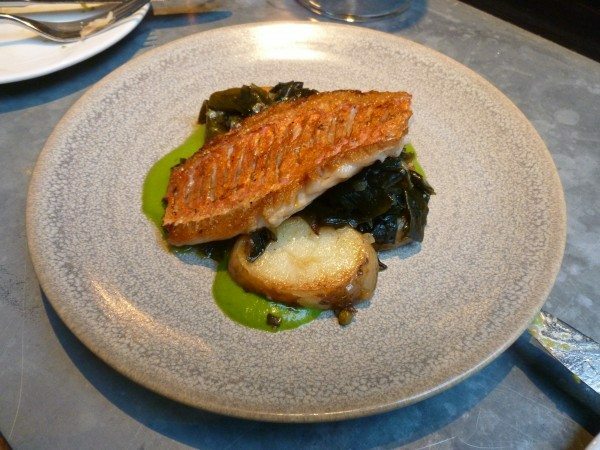 However, our final dish, red mullet with smoked Maris potatoes and samphire does not disappoint. “I think that’s the best of everything,” my companion says forking a mouthful of frim flesh and salty seaweed. “What was yours?” This from the chef. I’m included to agree, except same chef spent so long lovingly preparing the mackerel, right under our noses, that I don’t want to upset him by going for a dish cooked by a colleague. “I think the mackerel,” I say and maybe it was and I’ve simply forgotten how good it was and perhaps each subsequent dish which appeared to surpass it was, in fact, equally sublime. 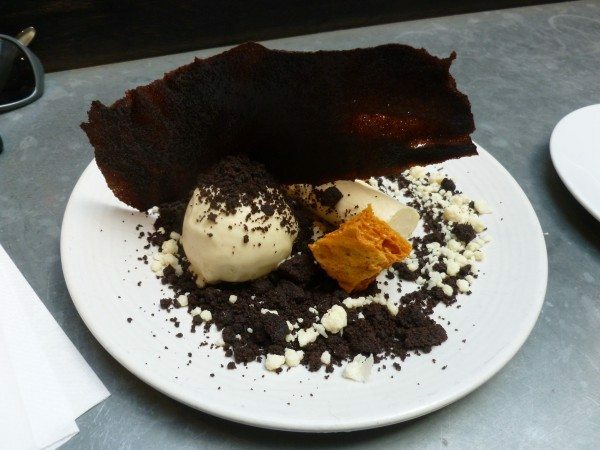 The white chocolate parfait with honeycomb and malted ice cream is a perfect way to round off the succession of delicious dishes. We hadn’t accounted for the openness of the open dining prompting a further offering. 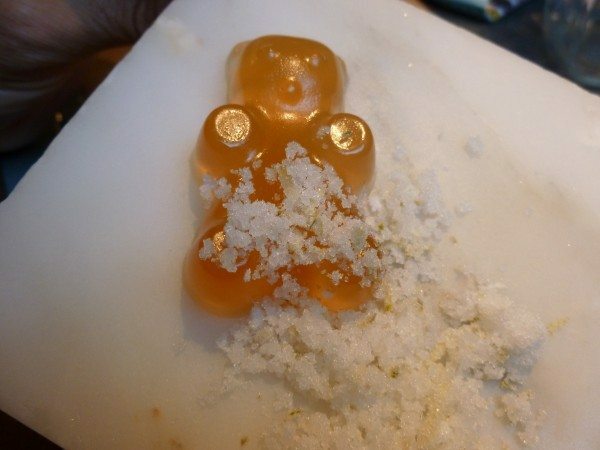 “Happy Birthday,” a chef, who’s been doing something with his back to us, turns around bearing a triumphant rum jelly bear on a bed of lemon sherbet. We hadn’t ordered this, but he’d heard us talking about the reaching of the milestone, seen a gift being handed over and unwrapped and decided to join in – that’s open dining for you.